> Monday, there were flurries for most of the morning. 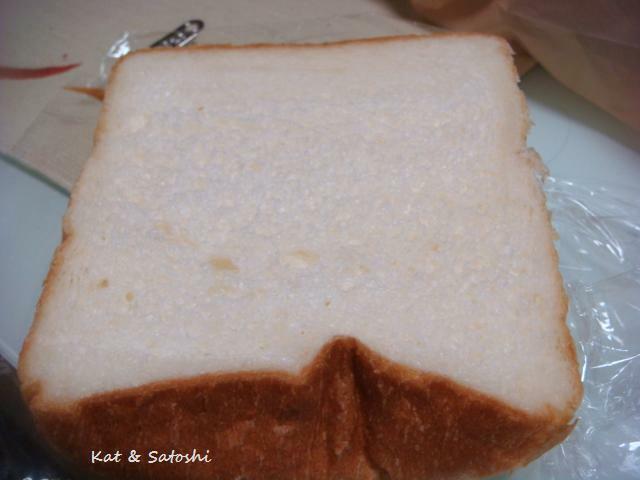 Satoshi was bummed because he had to go to work, he wanted to stay in bed where it was warm. By lunchtime, the sun had come out, but still the temps were down. For some reason, I still had agebitashi on my mind from the other day. I didn't want to do any type of frying though, so I took the easy way out. 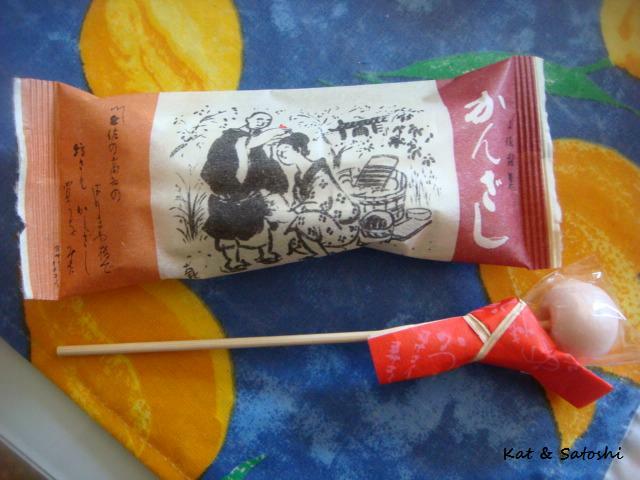 I bought some yakidofu (grilled soy bean curd), it is sold in the refrigerated section. 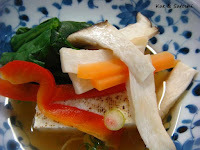 The tofu is firm and the outside of the tofu is slightly blackened. For the veggies, I stir-fried eringi, carrots, spinach and red bell pepper in a non-stick pan using no oil. Bring ingredients to a boil then lower heat and simmer for 2 minutes, take off flame and cool. To assemble, I heated the tofu in a pot with hot water for a couple of minutes. Then I poured several ladles of the warmed sauce and then placed some of the veggies and sprinkled some sliced green onions. 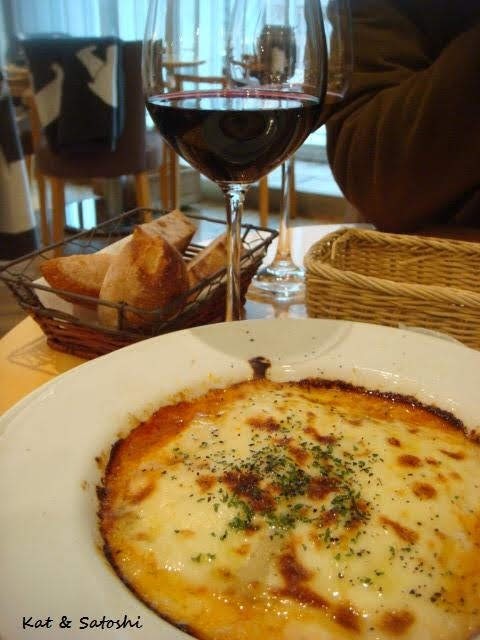 NOTES: delicious and perfect on a cold evening. I'm making this again. p.s. I want to thank Ana of www.ilovetortilladepatatas.com (her link no longer works) for the Liebster award she gave me. 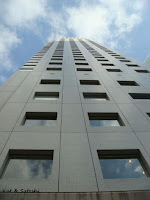 She has a great blog and is enjoying life in the Netherlands. Thanks Ana! During the winter months, our windows have lots of condensation on them. 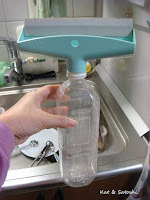 This gadget attaches to a a plastic bottle and while you squeegee the windows, it catches the water. Then after you are finished, just removed the squeegee and dump out the water. I was sad the other day, one of my favorite measuring spoons broke. I was spooning out some hardened honey, and "snap" the handle broke off. I figured the measuring part still "works" so I threw out only the handle. Are you using any interesting gadgets in your house these days? Last week, the weather got a little warm and then decided to go back towards winter, so for the next couple of days we're in the single digits....brr! In fact, yesterday, we had a little snow...woot! Some random things I'm liking (disliking)....not really liking this green tea from Fauchon. 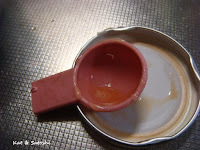 It tasted like the metal can...boo! 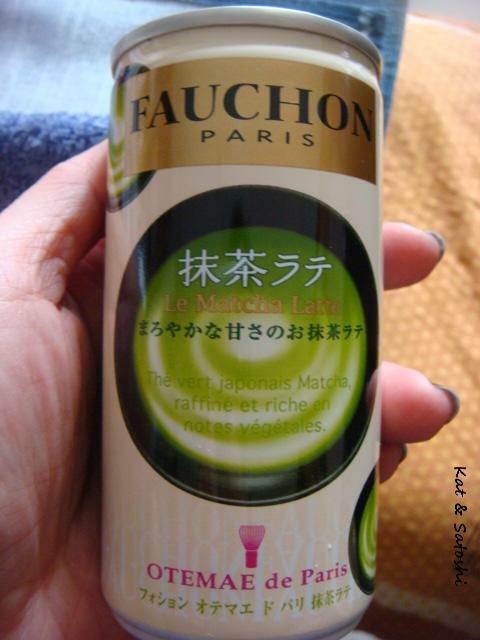 This version, had milk and sugar added to the green tea....blah! 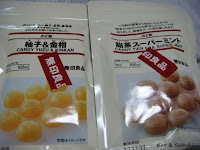 Am liking these two throat drops by MUJI. One is a yuzu (citron) & kinkan (kumquat) and the other is tien-cha (Chinese blackberry). 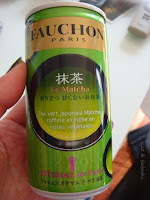 The citrus one was a bit on the sour side and the tien-cha had a menthal flavor. During the winter I find having a little throat drop in my mouth is a great way to keep my throat from getting dry and scratchy. 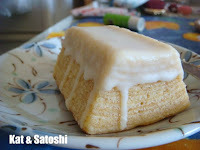 MUJI's lemon baum kuchen...this was lemony and very moist. 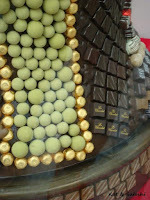 I really liked this shop's window. 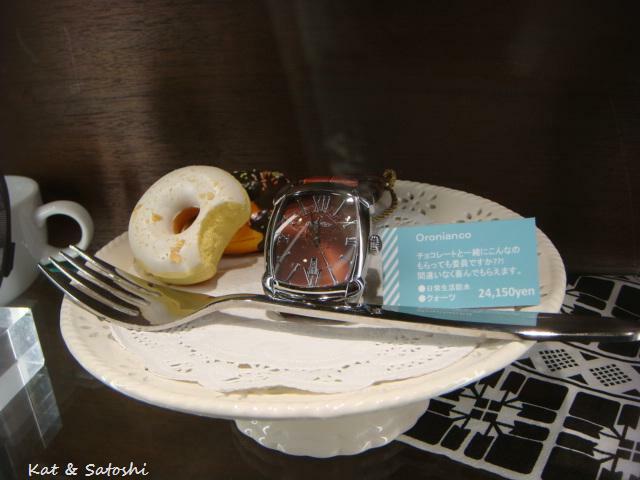 They put their "chocolate" watch on a plate to make it like a dessert. 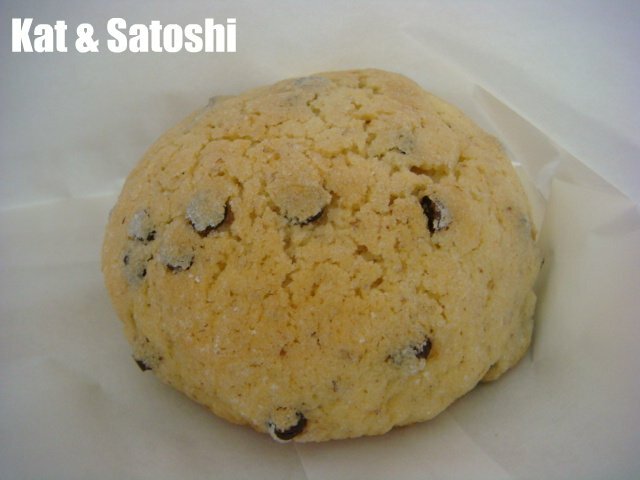 Satoshi and I love this snack. Iwatsuka Seika's Ebi-Kari (shrimp curry). Crunchy shrimp crackers are flavored with a spicy curry and a handful of roasted peanuts. On the bottom, caramelized onions, and on top, pieces of peppery roast chicken...delicious. 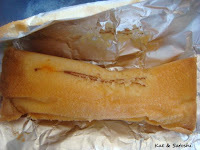 Dominique Saibron's melon pan (a butter roll with a cookie topping). They only make 200 of these a day, it was so-so. 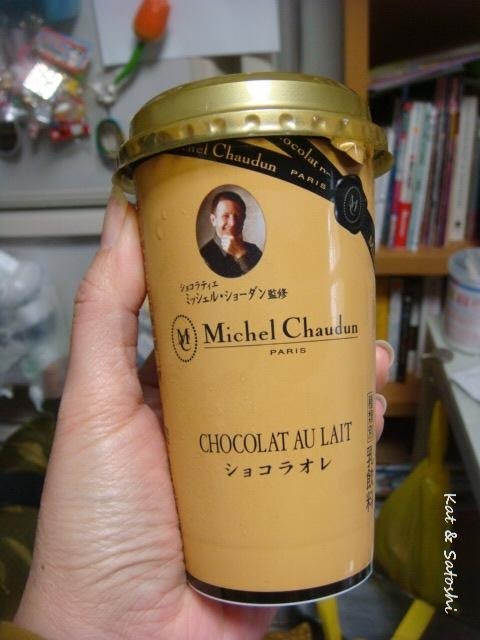 Michel Chaudun's chocolat au lait (chocolate milk)...rich and creamy. Friday, I met up with a friend that I hadn't seen for quite some time, Mari. She took me to her neighborhood soba shop...Sobakiri Masa. This shop seats about 20 and fills up fast during the lunch hour. After ordering you need to wait awhile for your food, so if you're in a rush, it is probably not the place for you. This shop makes their noodles by hand and cooks them after you order them. While you wait, they give you some futomaki (a type of sushi), hand rolled by the owner. 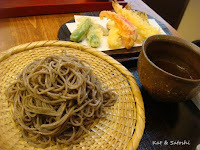 I ordered the Tenzaru Kuro, this was soba (buckwheat noodles) was made not only from the ground buckwheat grains, but also the hulls, which gives it a darker color and nuttier flavor. This came with assorted tempura, light and crispy eaten with sea salt. Mari ordered the Tenzaru Shiro, this soba was made solely from the ground buckwheat grains, so her noodles were much lighter. Her noodles also came with an assortment of tempura. Everything was delicious and it was nice to catch up with her. Thank you for a great day and for lunch, Mari! The other day, I met up with Kazumi. She introduced me to her dentist, so now I plan to go to him instead of the one I've been going to, Kazumi's dentist has better rapport. Instead of having coffee though, we did some of Kazumi's errands and ended up at a tapas bar near Yodoyabashi, Faro D el Poniente. Choose daily tapas from their refrigerated cases, salads from another. And order hot items from their picture menus. 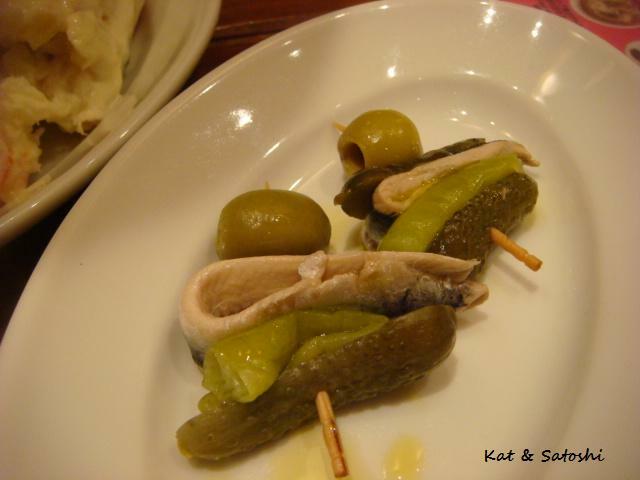 We started out with Banderilla...a slice of iwashi (sardine), cornichon, olive & sport pepper, salty & spicy...delicious. 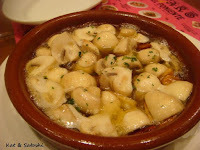 Next, champiñones al ajillo...this came bubbling hot! Mushrooms and slices of garlic soaking in bubbling olive oil, a little chili in there too. Perfect with some sliced baguette. 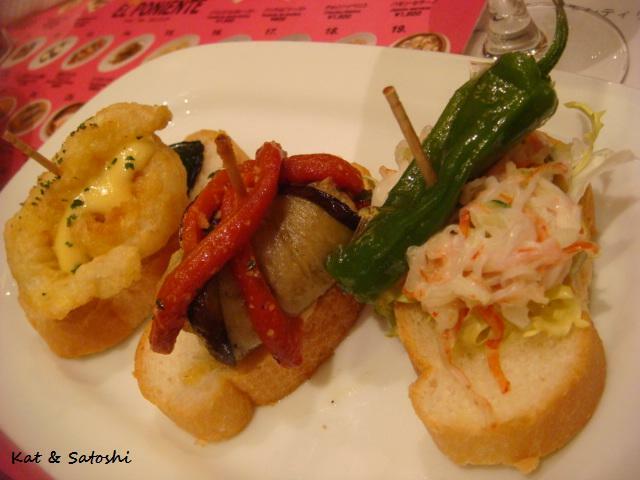 Assorted tapas: (from left to right) fried squid with zucchini, fried olives with eggplant & red bell pepper, and crab salad. 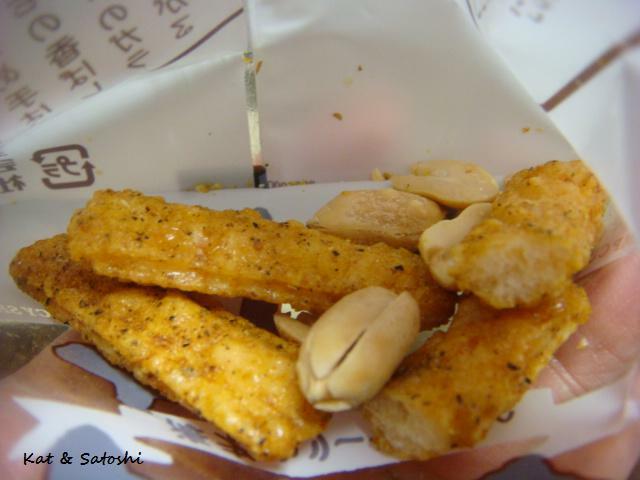 I liked the fried olive one best. 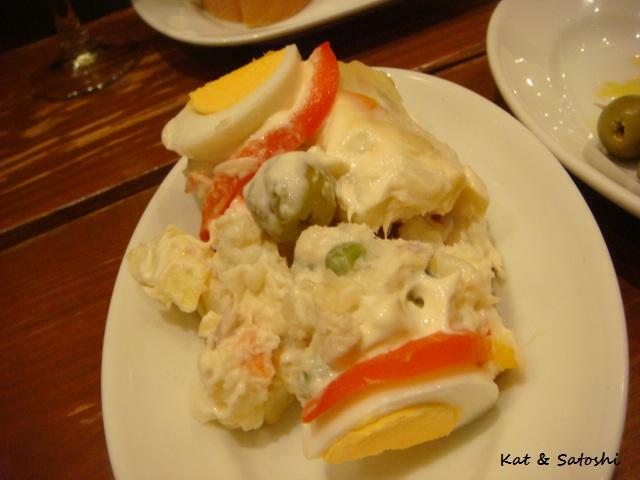 Russian style potato salad...potato salad with tuna in it. Tasty and sort of reminded me of something I've had in Hawaii. Country style frittata, a fluffy omlette filled with potato, green beans, bits of chorizo...delicious! 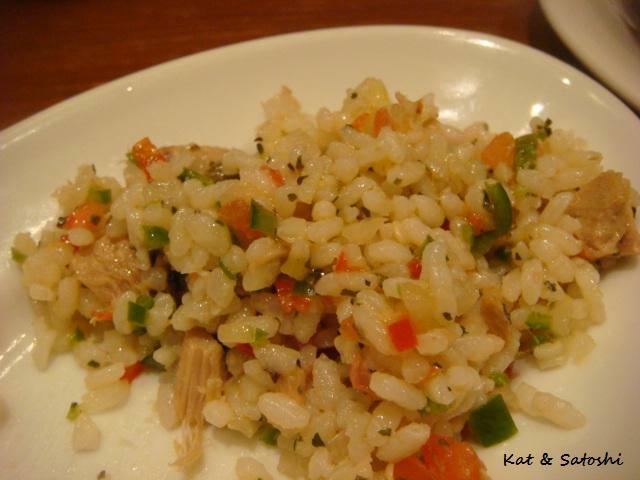 A serving of cold rice salad, delicious and a great way to offset some of the oily foods. This was unusual but delicious, cinnamon flavor and hints of citrus too. 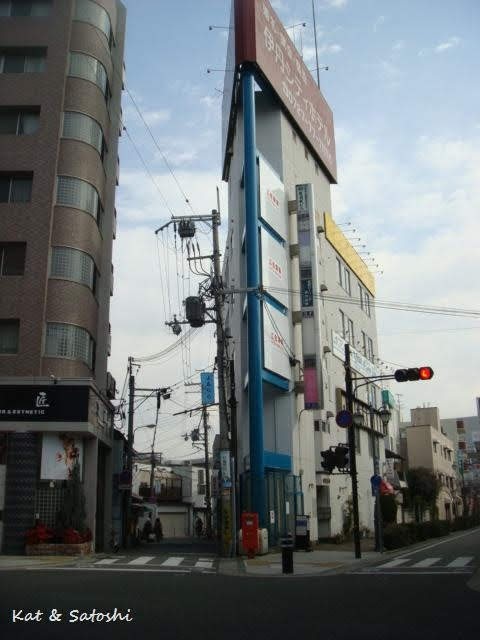 I told Satoshi about this place and he wants to check them out, so we'll be back. 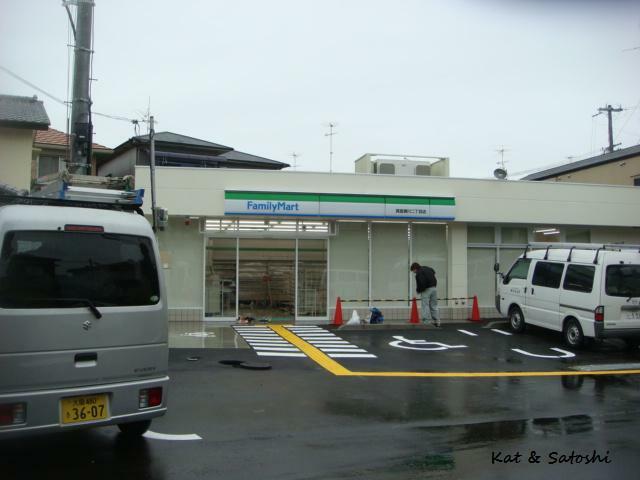 In 2008, our neighborhood convenience store closed down, which I wrote about here. 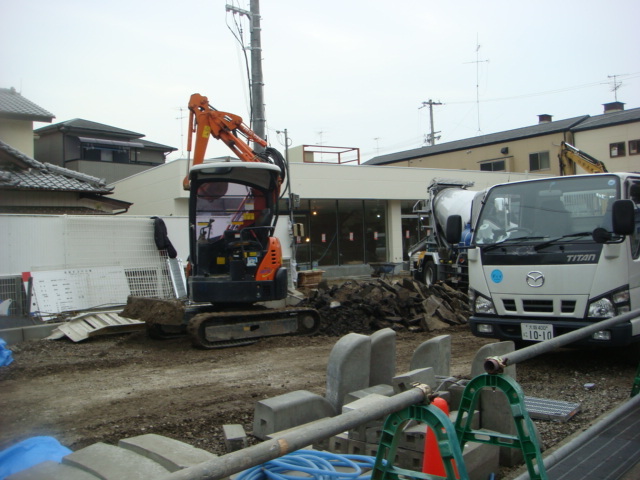 After they cleared away the building, it was turned into a parking lot. Satoshi said that turning land into parking lots is a great way to "firm up" the soil. So, most times while they wait for the land to "firm up" to build something else on top, they make temporary parking lots. 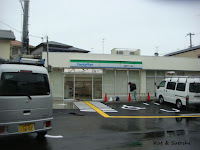 Another convenience store...granted it was a different convenience store from the previous one, but still. 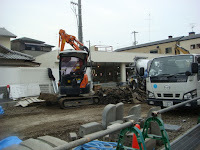 In Japan, I see a lot of construction, tearing down of buildings then rebuilding, sometimes they gut out the buildings too. And sometimes there are really old buildings, that haven't been used in many years, just wasting away, waiting for someone to use them. And while I realize it is work for construction workers to build and tear down these buildings, I think it is a waste of resources. 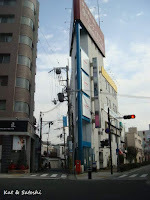 Do many shops in your town build things then tear it down soon after? It's Friday here, I hope your weekend is a good one. Actually this restaurant and the fruit/veggies stand are related, family operated. We've passed this place many times and always say we'll check them out, well, we finally did. 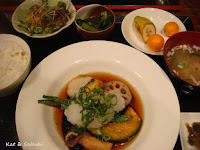 Satoshi chose their wagyu stamina set, this came with some rice, a salad, miso soup, a small dish of komatsuna (a kind of chinese cabbage), tsukemono (pickled veggies) and some fruit (banana & kumquats)...800 yen. 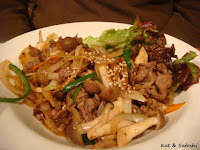 His main dish was thinly sliced wagyu sauteed with some mushrooms, carrots and other veggies. 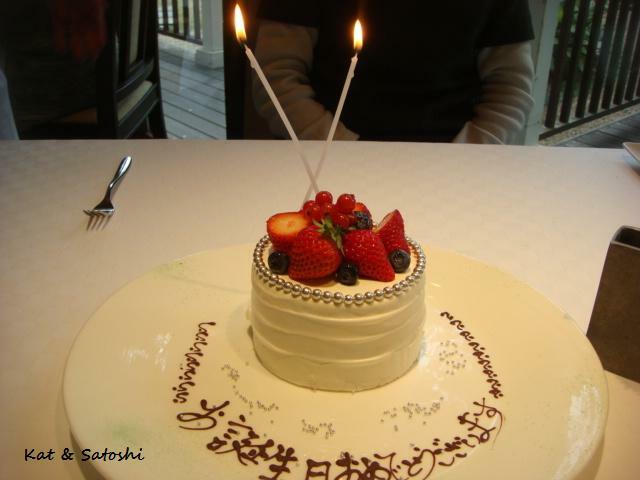 I ordered their yasai agebitashi set, this also came with the same sides like Satoshi's meal...800 yen. Agebitashi means that the veggies are slightly fried then served in a sauce. This reminded me of tempura without the batter. 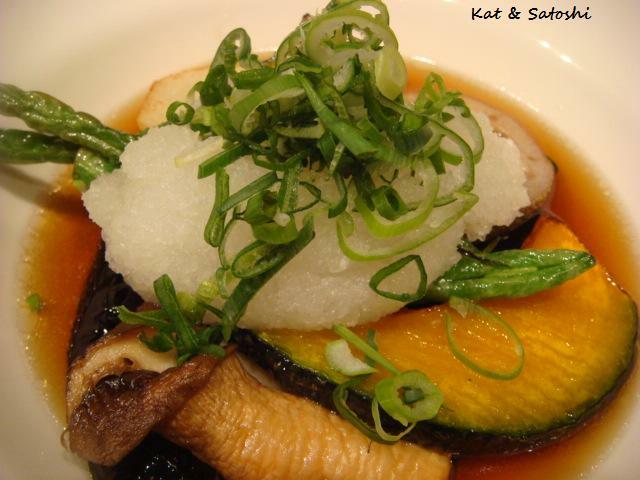 There were all sorts of veggies (chinese yam, eggplant, kabocha, lotus root, eringi & green beans) topped with thinly sliced green onions and grated daikon (long white radish). Except for them allowing smokers, we enjoyed their food, lots of vegetables and reasonable prices...we'll be back. Well, I turned off the "prove you aren't a robot thingy" because I hate to have to "prove it" on other blogs and felt why should you have to on mine?! 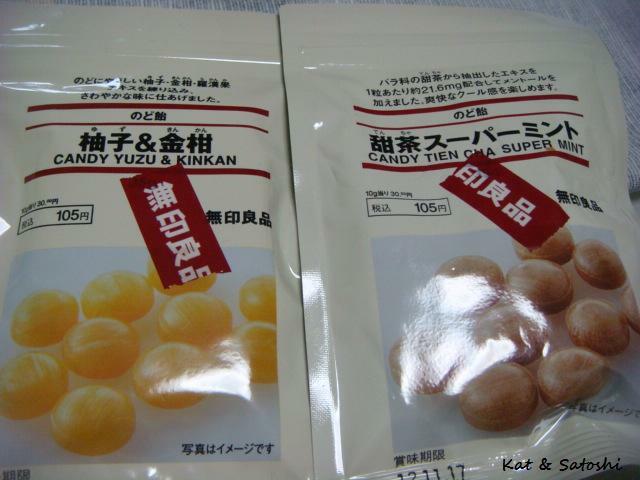 Anyway...Satoshi recently brought back this sweet from Kochi, which is located in Shikoku. It is called kanzashi and is made by Hamako. 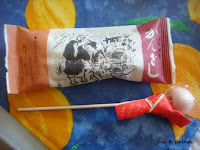 Apparently this sweet was created in 1972 for their Yosakoi festival and is the first one in Japan to be baked in foil. Kanzashi is actually a decorative hair ornament. You can read more about it here. 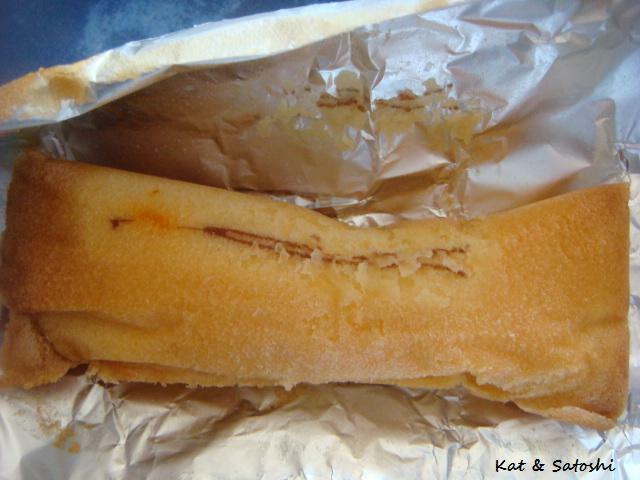 The yellow cake is slightly favored with yuzu (citron) orange and is filled with a sweet white bean paste that has a slight cherry flavor. On the outside, a picture of a kanzashi is stamped on it. A box of these also comes with a kanzashi lollipop. Friday, we had flurries and even a little snow. Most of if melted by the time the sun came out on Saturday. Saturday, I went out for a walk and noticed two ume trees in Suigetsu Park have bloomed. In the afternoon, we had more flurries and a little more snow. It was nice watching it whizz by the window like we were in some kind of "spin cycle" with some styrofoam. 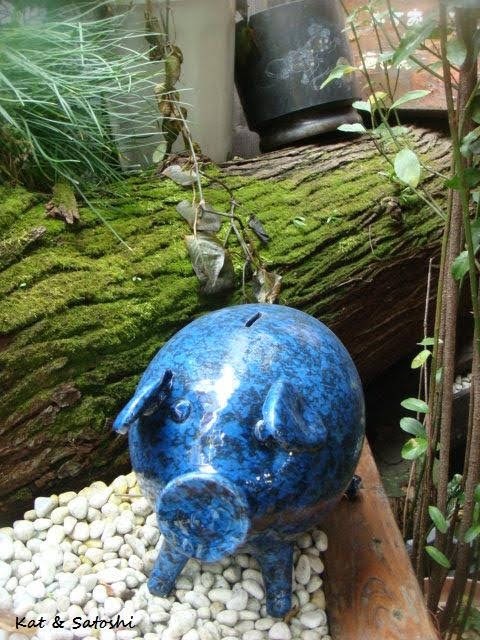 Sunday, we awoke to a beautiful blue sky and sun! but it was still very cold. 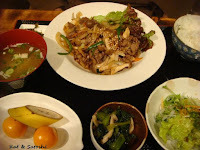 Not wanting to stay indoors all day, Satoshi and I walked to Ikeda for lunch. We tried a ramen shop called Kazuya. 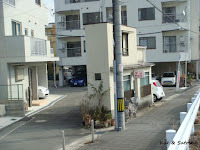 It is located right next door to the Rakugo museum. I've talked about rakugo before, here. 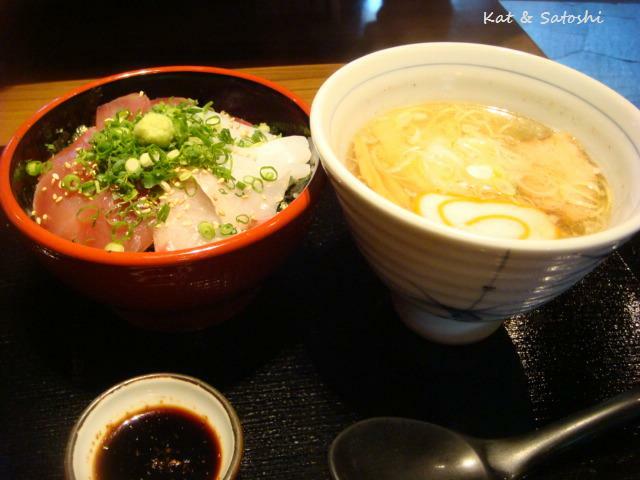 Satoshi ordered the mini shio ramen (salt broth noodles) with kaisendon (seafood bowl)...1030 yen. This was so...small! 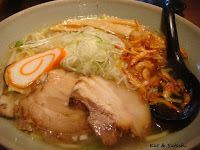 The ramen had barely anything in there and the noodles were really thin. I ordered the shio ramen with sakura ebi (sergia lucens) and veggies....850 yen. My bowl of noodles were at least 3 times the size of Satoshi bowl of noodles. After eating about a fourth of my bowl, I gave the rest to Satoshi and ate his bowl of noodles. He felt bad because he knew how small his bowl was, but I felt even worse because his meal had so little. The service was really spotty close to being bad even with the crowd they had. While the broth was delicious, in the end, we decided this ramen shop was not worth coming back for. 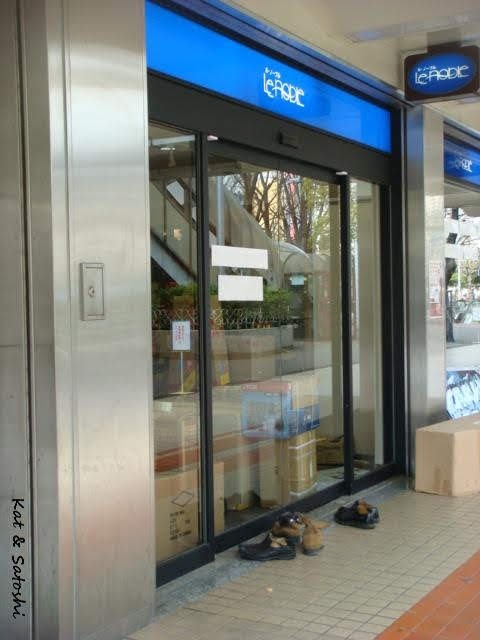 In Japan, there are many times when you need to take your shoes off. Before entering a home. At some restaurants, if they have you sitting on tatami (straw mats). In Hawaii, most of us take our shoes off too before going into the house, it is a custom that was passed down from the Japanese immigrants, and has pretty much spread to most other cultures in Hawaii. But when I saw these shoes outside a storefront, I was kinda puzzled. Why did they need to remove their shoes? I was actually worried their shoes would get stolen. I looked inside and saw that they had put in new carpeting, guess they didn't want to get it dirty before their store opened. 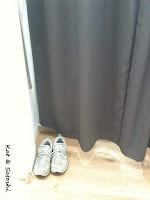 Another time you need to remove your shoes is when you try clothing on in a fitting room. 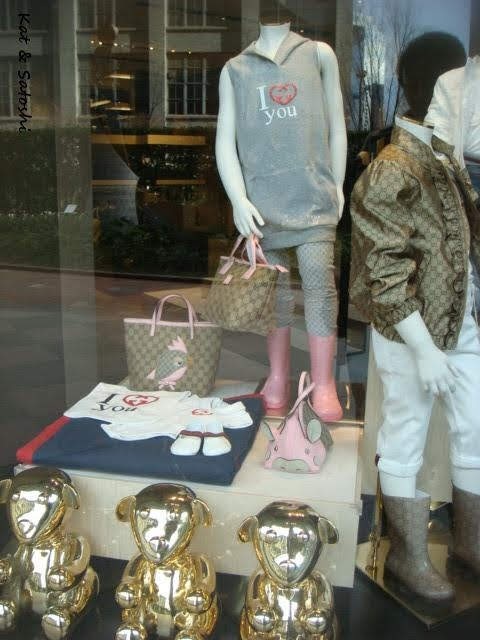 Satoshi had to do this when he tried on some pants. Oh, another time I had to remove my shoes was at the dentist. I took them off, put on their pair of house slippers and walked two steps over to the dentist chair. Most doctor offices have house slippers in their lobbies, you are expected to remove your shoes and use their house slippers while in their office. Guess it is a nice way to keep floors and carpets clean, but you need to make sure the shoes you are wearing are easy to take off and put back on. Do you remove your shoes before going into your house? 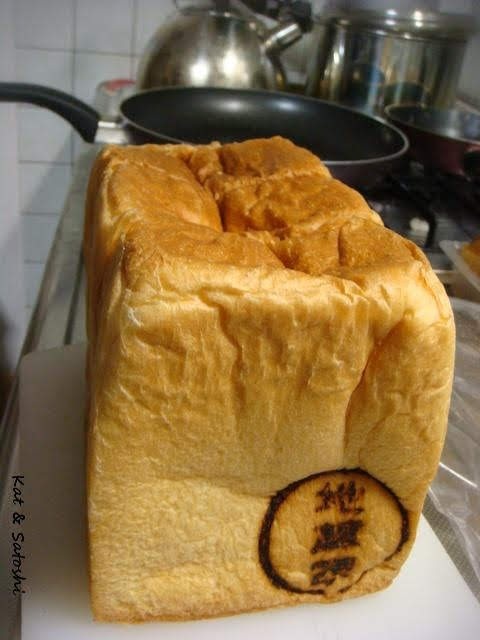 I think I've told you that my host-brother's wife is a foodie. 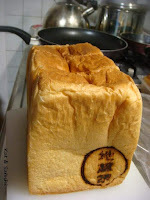 I'm so glad "all of my family members" are foodies...she gave us this loaf of bread on Friday made by a shop in her neighborhood called Jizoya. 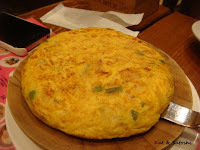 They don't use egg because many children in Japan have allergies to eggs. They do use flour, heavy cream, butter, sugar, salt and water. The results...a very light almost airy bread. p.s. you may have noticed a "prove you are not a robot" thingy when you comment, at first I had turned it off because I moderate (look over) the comments before it is published. Then, I noticed many "anonymous" comments started spamming, so I put it back AND will no longer allow "Anonymous" comments, please sign in with an appropriate ID...Thanks in advance for understanding. 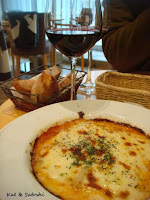 Yesterday, I was able to meet up with my host-mom and my host-brother's wife for lunch at Garden Place Soshuen. This large estate was the vacation home of a plutocrat and then after the war in 1946 was turned into a Chinese restaurant called Soshuen. 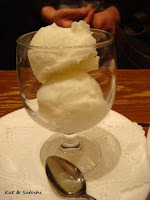 The estate survived the large Kobe earthquake of 1995 and in recent years, was turned into a wedding restaurant facility and the name changed to The Garden Place Soshuen. 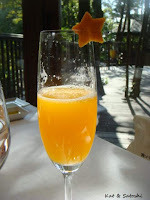 We started our lunch with a cocktail. 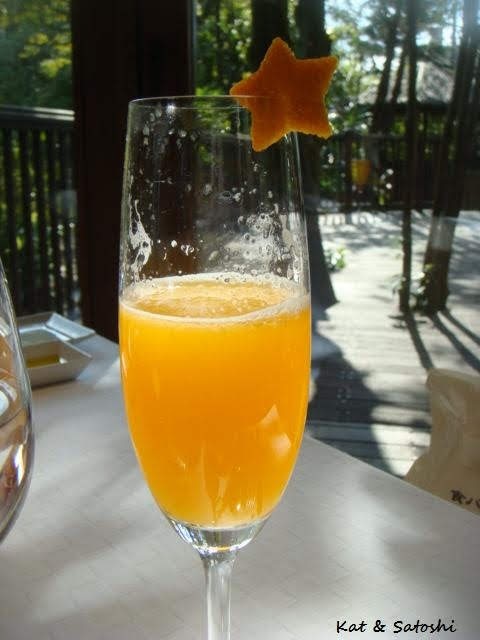 This is made with sparkling wine and the juice of a himepon (literally, princess citrus, it is a type of dekopon)....very fruity. 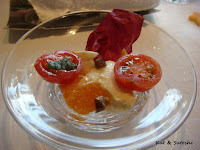 The amuse bouche was mozzarella cheese with pieces of citrus and bits of anchovy, some capers...delicious. Appetizers were a scallop and kanburi (type of yellowtail) marinated in an agrodolce (sweet/sour) sauce and served with some caponata. 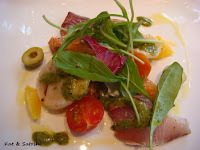 It wasn't too sweet or sour, I enjoyed this dish because the scallops were grilled and had a nice flavor. 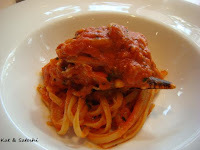 Lobster linguine...delicious lump of lobster, but the meat inside the claw was a bit difficult to remove. 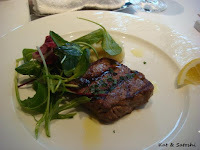 A sirloin piece of "akaushi". Akaushi is the brand name of wagyu in the Kumamoto area of Japan. Tender and delicious with the silky gorgonzola mashed potatoes. Dessert was a strawberry shortcake. This is different from the shortcake that is more widely known in the States. 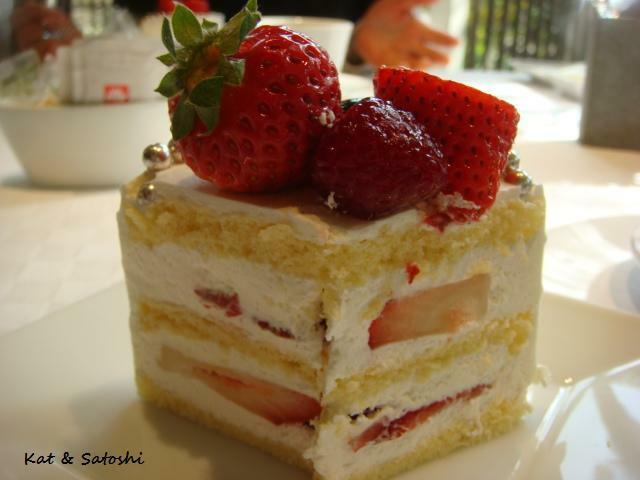 Japan's strawberry shortcake is a yellow sponge, filled with fresh whipped cream and strawberries. The waitstaff asked if we wanted the cake cut, and we did, so she cut it into thirds. 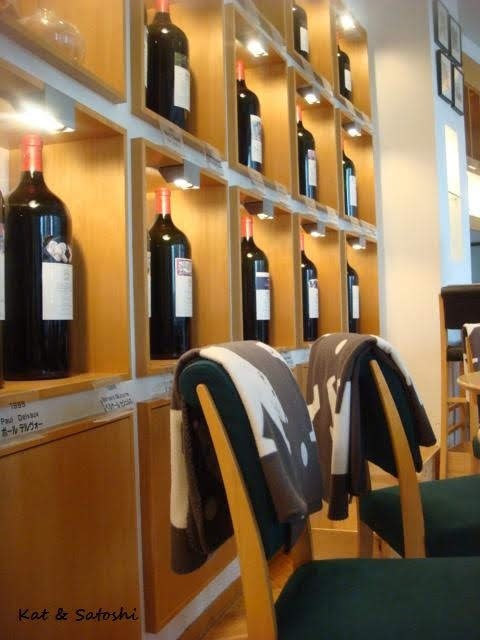 There is a company that has wine shops around Japan and overseas called Enoteca. 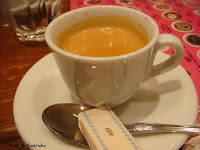 We have one in Osaka and they have a little cafe/bar towards the back of the shop. I've always wanted to try their food, so one weekend, when Satoshi didn't have his language class, we went to check out their lunch menu. Both dishes came with some bread, a salad and a beverage. You can choose a hot beverage like coffee or tea, soft drinks or wine. 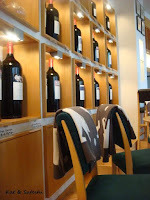 Since we were in a wine shop, Satoshi and I both chose red wine. 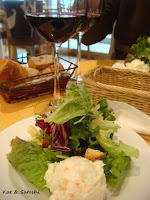 The wine they gave us was a 2010 Montes Merlot (Chile)...medium body and really nice for the dishes we chose. 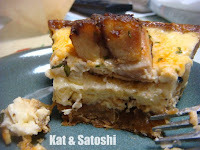 My lasagna came screaming hot while Satoshi said his dish was kinda lukewarm. He said it tasted good but wished it had been served a little hotter. He did enjoy mopping up his stew and the end of my lasagna with the bread. We want to try their pupus (appetizers) on their evening menu...we'll be back. Open 11:00-22:30, closed when Herbis Plaza is. It's Friday here, hope you have a great weekend! It is amazing what you see when you walk your usual walking route in the opposite direction. I noticed this teeny hair salon. I don't think they are still in operation though. Usually from the train you can see the side of the building, but when I walked towards it, I noticed it is like a slice of pie. 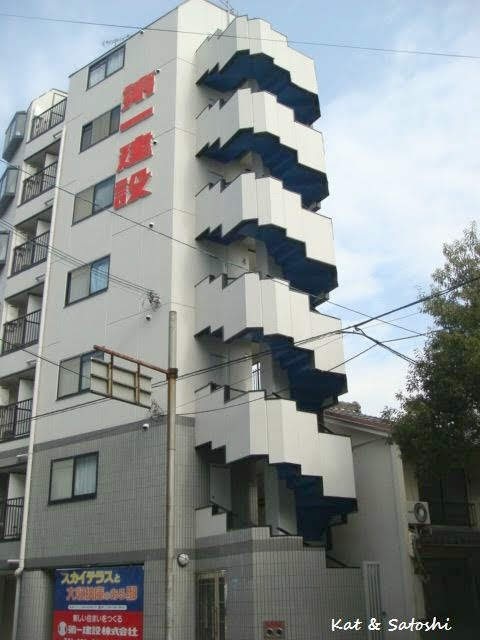 I also noticed these stairs. 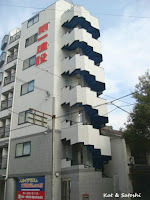 Thought is was fun how they painted the underneath of the stairs a different color from the building. 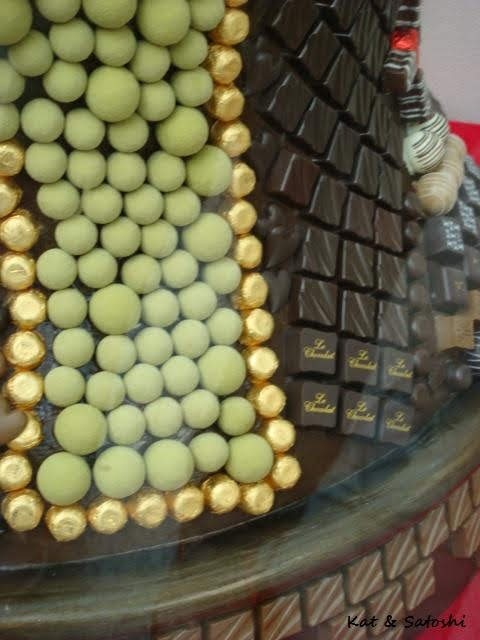 At a shopping mall they had a contest, you had to guess how many chocolates were used to cover the bell. 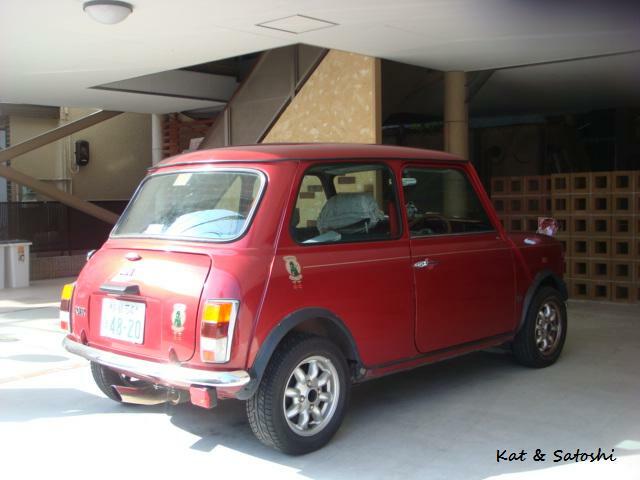 Every time I pass this apartment building, there is a MINI that is covered. No matter what time of day I pass by, it is covered or gone. At one point, I was so curious to see what was under the cover, I almost lifted up the cover...good thing I waited. 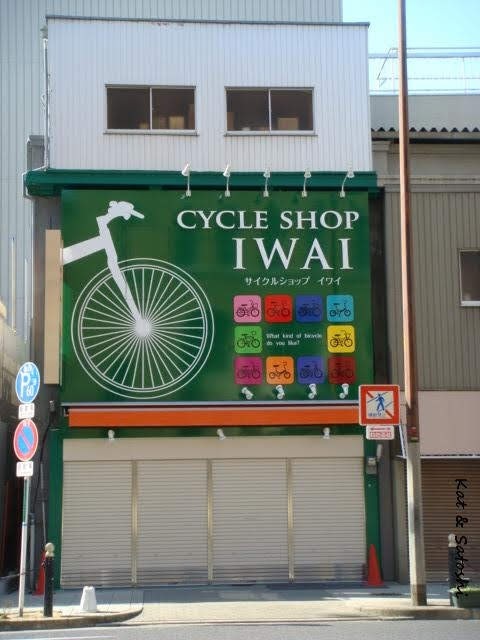 We passed by this bicycle shop in Osaka. 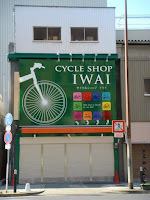 I loved their sign, "what kind of bicycle do you like?" it says. 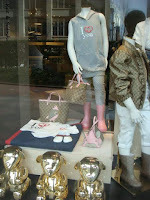 > Satoshi and I were in awe of the items at Gucci...for kids!